Apples, Leaves and Boots: Welcome Autumn! Every season is about change, but what is it about Autumn which REALLY feels like change? The air becomes crisper, just like the apples abundant in markets, shops and in seasonal recipes. I don’t know about you but I think about making an apple pie, “apple crisp” and I’m suddenly yearning for home made apple cider. Not that I’ve ever had it but the idea came to me from a book I read last month, The Woodlanders by Thomas Hardy. This book is set exactly where it sounds like it’s set – the woods – as well as in the English countryside in the 1800s. There’s a character who has a travelling apple press and, come Autumn, well it’s his season! The abundant apple harvest means this one man tradesman needs to call in the favour of friends to help him pick and press apples; apples which become cider, cider which supplies a village until the next harvest. There’s something beautiful about Autumn because, as the harvest comes forth, it reminds us of the simple pleasures of life. Cooking. Eating. Nature. The world around us. While Spring may be about new life, Autumn brings forth what we have reaped. And if we’re not farmers, it reminds us that a harvest comes from our work, whether that be planting seeds, watering the garden or chipping away on a project. Apples, pears, pumpkin, royal figs (royal my own for emphasis, because there is nothing as majestic as a juicy, fresh fig), sweet potatoes and for those who make quince jam, this is the season for it. 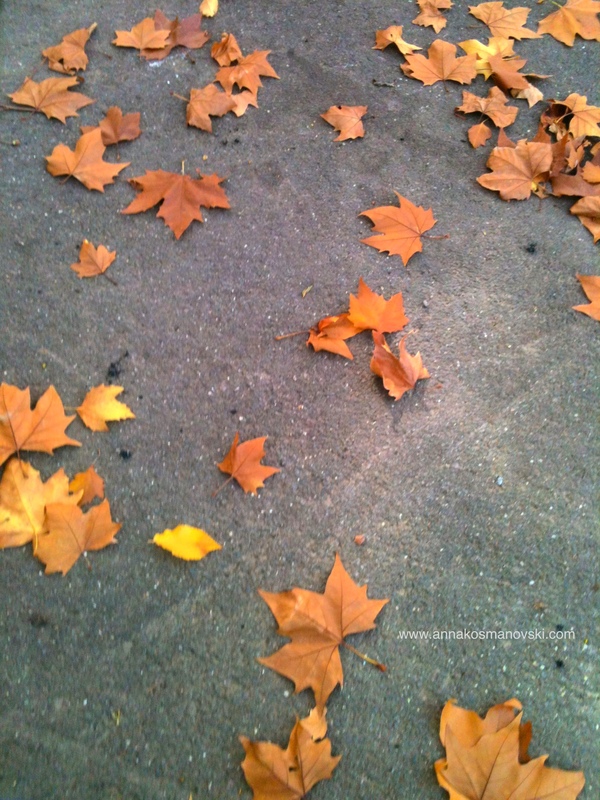 Even a concrete pavement looks prettier with crunch Autumn leaves strewn on it! Last night I went down to my local fresh produce shop and stocked up. The cashier, filling up my giant white shopping bag, originally designed for another purpose, asked me how my day was. I told her and then, as it was quiet and there was no one behind me, I couldn’t help blurting out my real feelings. “You’re not the only one,” she laughed, telling me that afternoon had a particularly busy trade. I was, maybe, her second last customer for the night. Later that night, I pulled out all the recipes I had been looking at that day and then, of course, disregarded them. Studying them is influence and education enough and gives me the confidence to try my own spin on them. I cooked up lasagna, for only the second time in my life. Two trays. I couldn’t believe how many little containers I could fill up with lasagna pieces, destined to wait in the freezer until a day when they would be more helpful. But there was a new ingredient to play with, one I’ve never worked with before. Kale has always scared me for its unknown factor. It reminded me a bit of silver beet but, I knew, needed to be treated differently. A helpful conversation with a cafe chef about kale last week, a few Google searches later on “kale” and I was ready to go. My goal was to make a nourishing, seasonal vegetable soup. A green soup. That I did and with delightful results, although I overcooked it a little bit. Like the lasagna, I dished out the soup in containers with two destinations. Freezer. Fridge. 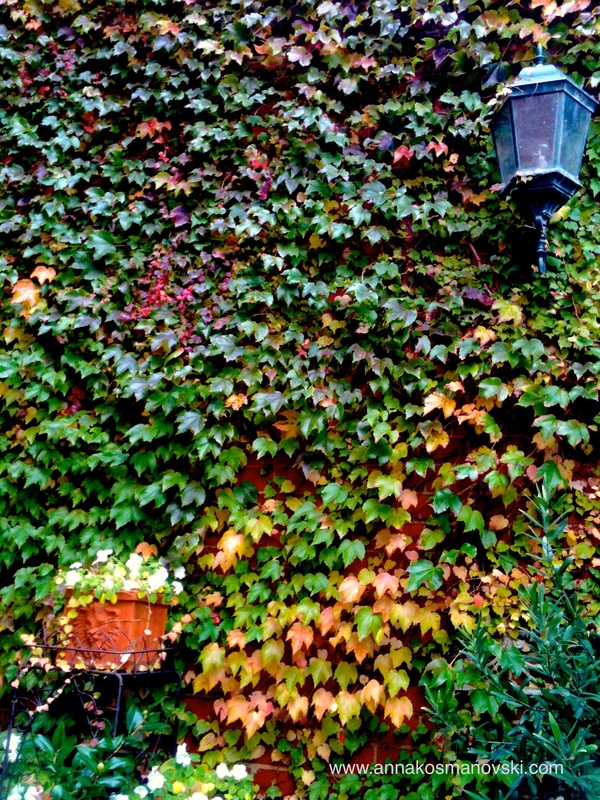 Autumn leaves on a wall. As well as the gorgeous scenery, the crisp air and the harvests of apples and pumpkins invading local fruit stores, there’s also something else really appealing about Autumn. Finally! We can pull out the knits and jumpers, hidden away since Springtime blew the cold away last year. Leggings, tights, thick coats and let us not forget the hats, scarves and even gloves too. Once hidden away out of view – sore competition for summer’s thongs and shorts – its their time to be emancipated. I cannot take credit for being original in my Autumn dress choices because something within me gravitates towards the colours of the seasons. Oranges, burnt red, caramel, some greens and a million hues of brown influence my choices. This is the time of year when I walk past shoe stores and see new season leather boots with price tags that hurt and I, well gaze, at such beauty. 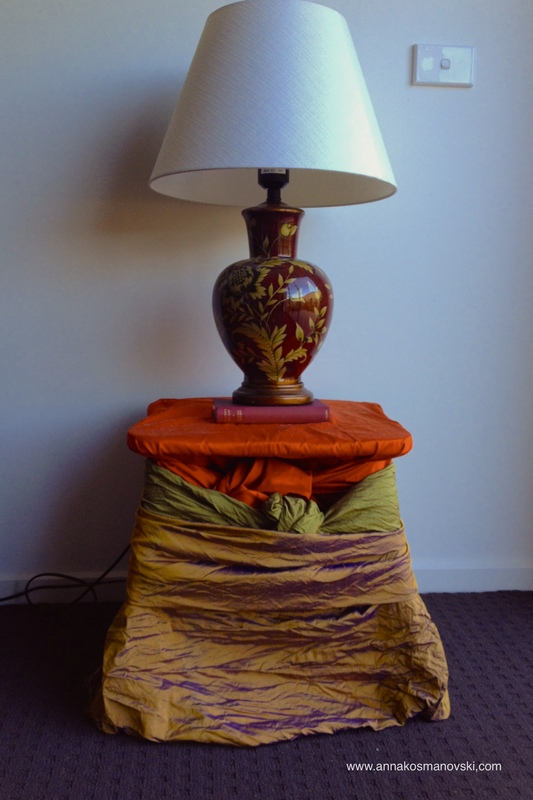 Even my lamp table got dressed up in green, gold and orange … the Autumn signature palette. But the best news is this. The beauty of Autumn is not even one third of the way through. It only gets better – more dramatic, more beautiful, more inspiring – as its winds up to its finale. With such beauty, I’m happy to acquiesce with the inevitable coming of Winter. Next PostHow potent is your writing?